•Select the licenses for which you want to edit attributes and click on the Product Attributes button. Use the Ctrl key of your keyboard to select multiple items. 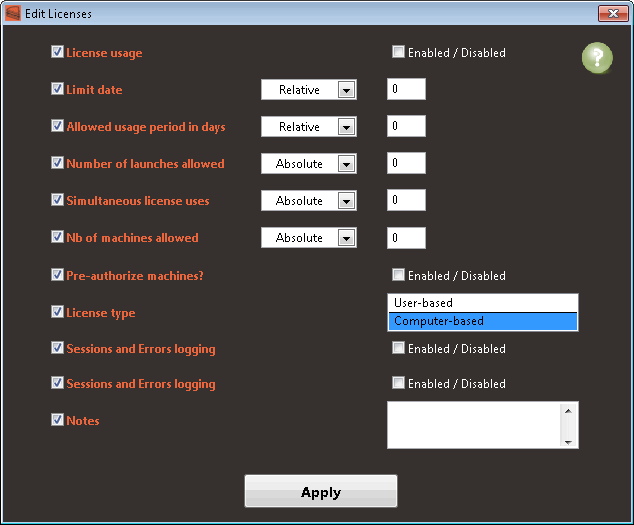 •The list on the left displays the available attributes for license batch modification. Select the attributes you want to change. •For each selected attribute, you can the new value to apply. For numeric attributes, you can also choose if you want to update the value relatively to the license's current value or set an absolute value. For the Limit date set Relatively, the value must be specified in days. •Click on Apply to apply the changes to selected licenses.